Harbor seals are the most common marine mammal along the Pacific Coast. They are generally blue-grey with light and dark speckles on their body. 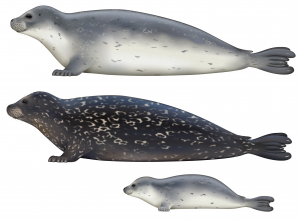 Harbor seals are part of the “true seal” family called Phocidae. This means they lack external ear flaps, and have short forelimbs, which restricts their movement on land. Harbor seals will haul on on land to rest and can be seen with head and flippers elevated, resembling a banana. They haul out to rest, for thermal regulation, to give birth, social interaction, and avoid predators. It is common to see harbor seals congregate at desirable “haulouts” or resting places. You have a higher chance of spotting harbor seals when looking at rocky shorelines, especially rocks that are exposed at low tide. You can also see them swimming in the water and most of the time you can spot their head and body hovering at the surface. There is a good chance you can spot a harbor seal at all sites, year round, along The Whale Trail. Harbor seals live in coastal and estuarine areas throughout the North Pacific and North Atlantic oceans. They spend equal time on land and in the water and can occasionally be found in inland waterways and lakes. Harbor seals are considered “true seals”. They wriggle on their bellies to move, do not have external ears, and use their rear flippers to propel themselves through the water, unlike sea lions which are not considered true seals. Harbor seal fur provides excellent camouflage but little insulation; they rely on a thick blubber layer for warmth and buoyancy. Their front teeth that are pointed and sharp, well-adapted for catching, tearing and swallowing prey as opposed to holding and chewing. Harbor seals eat 7-10% of their body weight daily, preying on several species of fish and squid including pollack, flounder, cod and herring. They may dive to 1,000 feet for up to 23 minutes to hunt. Female harbor seals become sexually mature at 3-5 years and males at 5-6 years. Gestation is 10 months with pups usually born between May and September. A female normally has only one pup every year. Pups are capable of swimming at birth and nurse on milk that is up to 42% fat, which helps them quickly build up a blubber layer. Pups remain with the mother four to six weeks. Female harbor seals become sexually mature at 3-5 years and males at 5-6 years. Harbor seals mate at sea and females give birth during the spring and summer. Gestation is around 10 months and females will have one pup every year. Harbor seals can swim at birth and can dive for up to two minutes when they are only two days old. Pups nurse on 42% fat milk for an average of 24 days and remain with the mother for four to six weeks. Harbor seals sleep on land or just below the water surface. When sleeping underwater they will come up to breathe every 5-10 minutes without waking up. They must voluntarily open their nostrils in order to breathe. Harbor seals eat 7-10% of their body weight daily. When hunting they can dive up to 1,000 feet for as long as 23 minutes. They prey on several species of fish, such as pollack, flounder, cod, salmon, and also have been known to each squid and octopus. Harbor seals have been documented eating 77 different species of fish in the Puget Sound area and 60 different species in and near the Columbia River. Their front teeth are pointed and sharp which assist to catch, tear and swallow prey opposed to holding and chewing prey. Harbor seals are protected by the Marine Mammal Protection Act. On the west coast, the harbor seal populations are stable and some are increasing. Some harbor seals population are thought to be at carrying capacity. In the 1990s, the population was around 32,000 and now it’s closer to 40,000. In the three populations found around the Salish Sea, the San Juan Island population has 11,000, the South Puget Sound population is around 1,500 and the Hood Canal population is also around 1,500. The San Juan Island population has actually been decreasing since 2013 and the other two populations are increasing around 10-12% annually. From 1947 to 1960 bounties were placed on harbor seals in Washington due to the perceived damage caused by them on the salmon fisheries. After roughly 17,000 were killed, with no apparent improvement to commercial fisheries, the bounty was discontinued. They are protected under the Marine Mammal Protection Act and their numbers have rebounded. A main threat for harbor seals, especially in urban environments such as the Salish Sea, is the accumulation of toxins, like PCBs and PDBEs in their bodies, from their prey. PCBs peaked in the 1960s, however the effects of these chemical contaminants is everlasting. Other threats facing harbor seals are fishing gear entanglement, oil spill exposure, ship strike, and harassment while hauled out on land. Mothers will leave their pups on the beach for extended periods of time while hunting, making them extremely vulnerable. People and pets should stay at least 100 years away, as some mothers will not return if there are people and pets around her pup. Seal pup mortality is very high at around 50% in the first year. Other predators for harbor seals include transient killer whales, sharks, and Stellar sea lions. While on the beach, they can fall prey to bald eagles, dogs, coyotes, and bears.